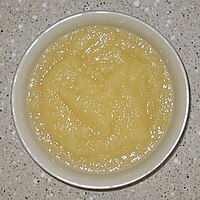 Applesauce is mostly ground-up apples. Acid, particularly citric acid, is often added for a sour flavor and to reduce browning. Applesauce is often eaten warm with a bit of Cinnamon sprinkled on top.